“In March 1960, in Madrid, two bombs exploded — one in the Ayuntamiento, the City Hall, and the other in the hands of the man carrying it, 27-year old Ramón Pérez Jurado, killing him immediately. A further three devices were discovered when the police raided the flat of another member of the team, Antonio Abad Donoso. Donoso was arrested, tried by summary consejo de guerra and garrotted in Carabanchel Prison within the same month. “The victims, Jurado and Donoso, were members of a previously unknown organisation calling itself the Directorio Revolucionario Ibérico de Liberación (Iberian Revolutionary Directorate of Liberation) or DRIL for short. “THE DRIL DEFINED ITSELF as a ‘democratic organisation of anti-fascist men and women of differing political ideologies and religious beliefs seeking to overthrow the Iberian tyrannies’. It was an anti-fascist umbrella movement, a ‘flag of convenience’ which sought to rally anti-Francoists and anti-Salazarists from across a broad religious and political spectrum. The Portuguese members were mainly supporters of General Delgado while its Spanish members were mainly drawn from among Spanish anarchists exiled in Venezuela. 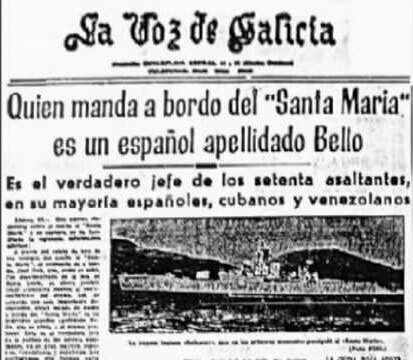 “After the deaths of Jurado and Donoso, the DRIL set about planning Operación Dulcinea — the hijacking of the Portuguese liner the SS Santa Maria. The objective of this imaginative operation was to mobilise world public opinion and rally opposition forces within Spain and Portugal (which apart from a handful of isolated urban and rural guerrillas had been virtually inoperative since the late 1940s) against the two Iberian dictators. “Once the vessel had been seized its new commanders planned to sail to the island of Fernando Pó (Bioko Island) in Spanish Guinea and on to São Tomé e Principe, Portuguese colonies, in order to launch an insurgency which they hoped would begin the process of liberating the Portuguese colonies of Equatorial Guinea and Angola. “The leaders of the operation had been exiles in Venezuela. 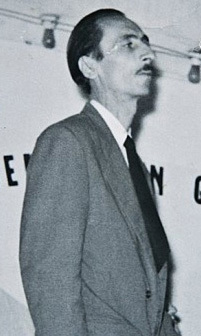 The overall director of the DRIL was an imaginative and charismatic Galician libertarian intellectual, José ‘Pepe’ Veló Mosquera, assisted by a Spanish republican naval captain, José Fernándo Fernández Vázquez, who operated throughout the operation under the nom de guerre of commandante ‘Sotomayor’. “Veló, however, was the organisational brains and inspiration behind the DRIL as well as the hijacking operation. ‘Sotomayor’ was the naval coordinator and Galvão the public face of the operation, given the vessel was Portuguese. Galvão wasn’t a member of the DRIL, he had been taken on by Veló at the request of Portuguese opposition leader, General Humberto Delgado whose Junta Nacional Independente de Libertação (JNIL), the ‘Independent National Liberation Council’, had challenged Salazar for the presidency of Portugal. Delgado was then living in exile in Brazil having denounced electoral fraud in the 1958 elections. “Veló had recruited his team of twenty-four men from among the hundreds of Spanish and Portuguese exiles in Venezuela. It was from this pool of exiles, all anxious for action against Iberian tyranny, that the DRIL had emerged. “The twelve Portuguese participants were led by Captain Henrique Galvão, an anti-Salazar activist who had fled Portugal in 1959 after being arrested and sentenced to eight years for an attempted coup d’état. The twelve Spaniards, including Veló’s and Fernández’s sons, were all anarchists recruited from the CNT and FIJL: Rafaél Rojo Ruíz, Fermín Suárez, José Pérez, Ríco, Basilio, Porriño, Yanes, Maso, Federico de Fernández (‘Sotomayor’s son) and Victor Veló (José Veló’s son). “For security reasons, the only information the team members were given was that they were to join the Santa Maria as regular passengers at the port of La Guaira in Caracas. The weapons, a sub-machine gun, two old rifles and some hand guns, were allegedly smuggled aboard in a coffin bound for Galicia. Galvão himself came aboard in Curaçao. “Only the three leaders knew about the hijacking plan; the activists themselves believed they were going to the Spanish colonies of Rio Muni and Fernando Pó to fight Francoism. They were, but they didn’t know they were taking the boat with them. Also, neither the Spaniards nor the Portuguese knew of each others’ existence until they met in Veló’s cabin for the distribution of weapons immediately prior to the hijacking itself. “The Portuguese team captured the captain, Mario Simões Maia, and the ship’s officers who were asleep in their cabins. The vessel was renamed the Santa Liberdade and the yellow, black and white flag of the DRIL, with its five-pointed star, symbolising the brotherhood of the peoples of the world, was hoisted, replacing the hated Salazarist flag. Everything went smoothly and the ship silently changed course out of the Caribbean, towards the open Atlantic and the west coast of Africa. “On board were 350 crew and 586 passengers of whom 233 were Spaniards, 179 Portuguese, 87 Venezuelans, 35 Americans, four Cubans, three Brazilians, one Italian and one Panamanian. The high-risk operation had proved a success, but still no one outside the liner knew of the drama that had taken place. “The DRIL’s plans had to be changed when the ship’s doctor requested that José Peres de Sousa, the seriously wounded crew member, be put ashore for urgent emergency medical treatment. If he didn’t receive emergency surgical intervention quickly the young cadet would die. After a heated argument between Galvão — who initially refused to allow the injured man to be put ashore for emergency treatment — and Veló, who argued that the DRIL would be judged by its failure to act humanely, and what had been inspired by the highest ethical motives would be judged as an act of piracy. Veló and ‘Sotomayor’ won the day and the wounded cadet and half a dozen of his colleagues were put ashore on the nearby island of St Lucia in the British West Indies with $2,500 to cover medical expenses. “News of the audacious capture of Portugal’s prestige liner by radical political activists grabbed the world’s headlines on 24 January, 1961, overshadowing the inauguration ceremony of J.F. Kennedy, who had taken over the US presidency a few days earlier. “Initially, the news reports were confused with stories about ‘rebels’ and ‘pirates’ having seized the liner, but their motivation and intentions remained a mystery. First the BBC then the world’s news agencies began running the story that seventy Portuguese rebels led by Henrique Galvão, the former Portuguese army captain, had seized the Santa Maria. “The ship’s radio was taken over by ‘Pedro’, one of the Spanish team with telegraph experience, and the DRIL began issuing regular bulletins explaining the political motives behind the operation. To ‘Pedro’s intense irritation as an anarchist, Galvão broadcast a statement from the liner declaring Humberto Delgado ‘president-elect of the Portuguese Republic’, having been fraudulently denied his office by the Salazar dictatorship. “Initially the plan was to put the passengers ashore in a neutral port and press on to either Ghana or Guinea, but the news that the British navy, the Portuguese warship Pedro Escobar and the Spanish cruiser Canaria had set out in pursuit meant that this plan had to be abandoned. Then, on 28 January, a squadron of US aircraft and five US Navy vessels of the US Sixth Fleet appeared, including two destroyers, USS Gearing and USS Domato, and the nuclear submarine Seawolf. “‘Sotomayor’, the acting captain, told the Americans who were trying to block their course that they would not be stopped by anyone and that if they continued to obstruct them they would all end up at the bottom of the sea and the responsibility for the deaths would be on the Americans. “Only at this point did it emerge that this was not just a Portuguese operation: Spaniards were involved as well. The liner’s second mate, José Dos Reis, one of the injured put ashore at Santa Lucia, revealed that most of Captain Galvão’s men were Spaniards and ‘appear not to be under Galvão’s command’, but rather under the control of the enigmatic ‘Professor Bello’, a reference to ‘Pepe’ Veló. The embarrassing fact that Spaniards were involved was hushed up by the Franco government who wanted to maintain the impression that this was purely an anti-Salazarist operation. “To ensure the DRIL’s motives could not be impugned by charges of piracy or theft, Velo insisted that the ship’s captain, Mario Simões, and its bursar, Alfredo Madrugo Barcía, open all the safes on board and draw up an inventory of the funds held in them. They refused. However, ‘Pedro’, the Spanish radio operator had trained as a locksmith and he succeeded in opening the safes, revealing a hoard of US dollars and assorted South American currencies. “Surrounded by the US Sixth Fleet, the DRIL finally agreed to negotiate with the Americans. On Sunday 29th January, Rear-Admiral Allen Smith, second-in-command of the Atlantic Fleet, came on board the Santa Liberdade with a number of his officers and two CIA men to negotiate on behalf of Admiral Robert L. Dennison, the commander-in-chief of the US Atlantic Fleet. “Smith was received with full military honours and the Tannoy broadcast the US and Portuguese national anthems as well as the Galician anthem and the Spanish Republican Himno de Riego. It should be said that this annoyed the Spanish anarchists among the team, but their respect for Veló and ‘Sotomayor’ was such that they didn’t push the matter. “By this time most of the world’s press was on the side of the DRIL. As the New York Times put it, the US’s main responsibility was purely and simply to ensure the lives and safe disembarcation of the passengers. ‘It is not for us to protect dictators from their discontented subjects’. So upset was the Salazar regime at the hostile tone of the US press and its treatment of Galvão as a revolutionary rather than a common criminal that it threatened to throw the US military off its bases in the Azores. 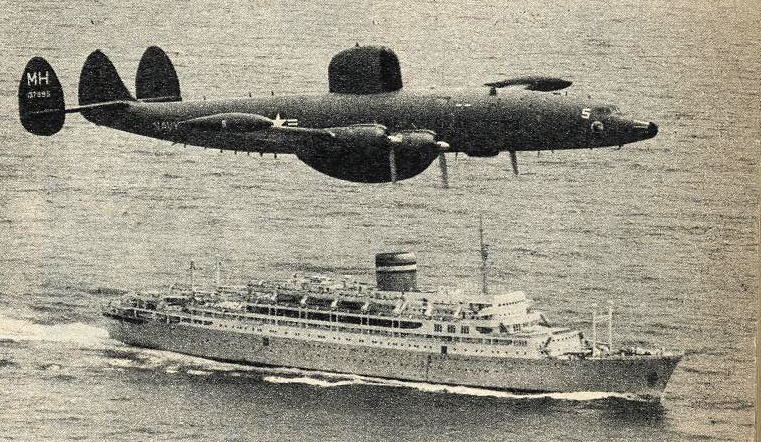 “As a result of these talks a few passengers were allowed to leave with the Americans in return for water and fuel. The main hand-over of passengers was to take place in the Brazilian port of Recife. 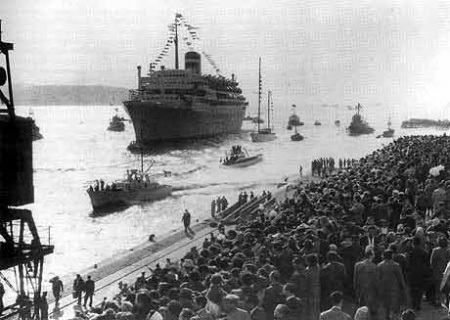 Recife, Feb 2, 1961: Santa Liberdade arrives in port to welcoming crowds. “The DRIL accepted the offer and on 2 February the Santa Liberdade entered the port of Recife to land her passengers. The reception waiting for them resembled carnival time, with enthusiastic crowds of thousands and thousands of people dancing and cheering them on the dockside. 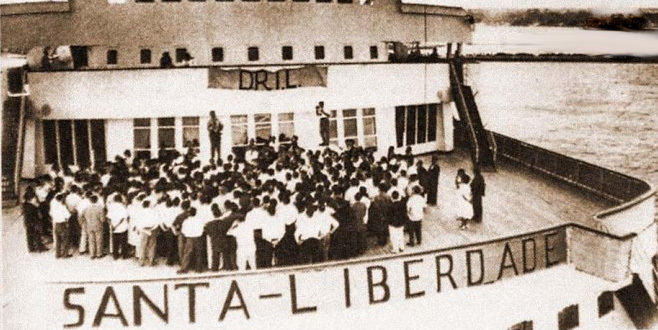 “The following day, 3 February 1961, the 24 DRIL members handed the liner over to the Brazilian navy and were ferried by naval tug and then by army bus to a police barracks in Recife where they were welcomed as political refugees. That night they attended a dinner laid on for them by the vice-president of Brazil. After twelve intense days that had caught the imagination of the world, the great adventure was over. “EVEN ALTHOUGH IT failed to achieve its primary objective of acting as a trigger to an anti-colonial struggle in Spain’s and Portugal’s African colonies, the daring DRIL operation did have positive unforeseen consequences. “On the day on which the Santa Maria was surrendered, 3 February 1961, the first armed clashes of the anti-colonial struggle occurred in Luanda, the capital of the Portuguese colony of Angola. “By their actions the DRIL showed that it was possible to fight back against dictatorship. The global coverage of the operation did an enormous amount to rouse the antifascist consciences of people around the world and of many anti-Francoist and anti-Salazarist opponents, in exile as well as at home. I recall quite vividly, as a fourteen-year old, watching the Pathé newsreels in the cinema and wanting to cheer the hijackers. “The DRIL approach launched a new form of action, pioneering the hijacking of ships and planes for political objectives. Specifically, seven months later, on 10 November 1961, the Casablanca-to-Lisbon TAP flight was hijacked by six passengers who then used the plane to drop manifestoes and leaflets over the Portuguese capital before turning back to Tangiers, where they were arrested by the Moroccan authorities. Waiting for them at the airport was Captain Galvão, dressed in the same uniform they had devised for the hijacking of the Santa Maria; black beret and trousers and khaki shorts. It was the first plane hijacking in world history. “The leading lights of Operación Dulcinea continued their struggle against injustice and dictatorship until the end of their days. Most never saw their dreams realised. Only Commandant Sotomayor outlived General Franco. 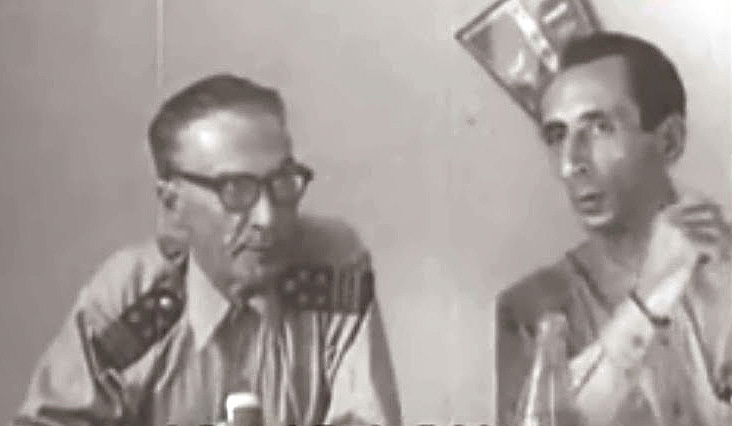 Pepe Veló died in São Paulo on 31 January 1972; Henrique Galvão died in exile in Brazil in 1973, a year before the ‘Portuguese’ ‘Revolution of the Carnations’; General Humberto Delgado was murdered in Extremadura, near the Portuguese border, in February 1965 in an ambush set up by agents of the PIDE, the Portuguese secret police (I met his murderers in Carabanchel during their short-lived detention). There were still a few of the DRIL team around in 2001, including Pedro, the radio operator, but they prefered to maintain the silence they have kept for forty years. “Importantly, for many Spaniards, the DRIL action highlighted the passivity of the exiled Spanish Libertarian Movement in Exile (MLE) and exposed the labyrinthine bureaucratic machinations which had obsessed the exiled CNT leadership since the end of the Second World War for what they were, pointless and self-serving excuses for inactivity.” — From ‘My Granny Made Me An Anarchist‘.